PuzzleMad: Not too chicken to pull its' legs off! I didn't realise until after I had posted but this is my 300th blog post since I began 4 years ago in March 2011! What a journey! What a lot of puzzling experience! What a lot of cash gone! Luckily this commemorative post (and the next) are about the work of truly fabulous craftsmen. Eric Fuller recently put up an update on his Cubic dissection and I was caught by surprise! I had known it was coming up some time soon but couldn’t afford to upset the wrath of the present Mrs S (she’s doing OK for a first wife!) by putting our evening meal on hold until the update occurred. I think she might have stuffed both hot dinner and various puzzles with sticky out bits into a place where the sun don’t shine - and that’s making me ill at the very thought! The end result was that I missed out on the Oskar’s Matchboxes that came out. BUT there were 2 absolutely gorgeous pieces that I did manage to get my eager mitts on. 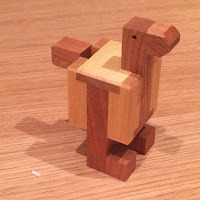 The Chicken puzzle designed by a relatively new designer Olexandre Kapkan and the rather historic Visible burr designed by the incredible Bill Cutler which was offered in the disassembled state or fully assembled for an extra $10. "This is probably my favorite puzzle of the update, and I spent a lot of extra time and attention on it. It’s whimsical for sure, but still an impressive level 10 solution. The Yellowheart and Cherry offset each other for that pleasing chicken look without all the annoying chicken poop everywhere. Or do they? 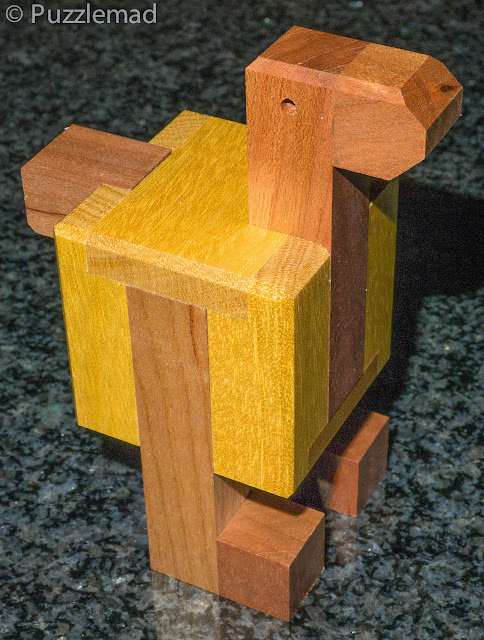 I’m very proud of the construction techniques used in this puzzle. The Yellowheart cage is made of only six pieces; each corner wrap around was milled from solid wood. The burr internals sit flush with the outer pieces with notch joinery, providing uninterrupted sidegrain area. 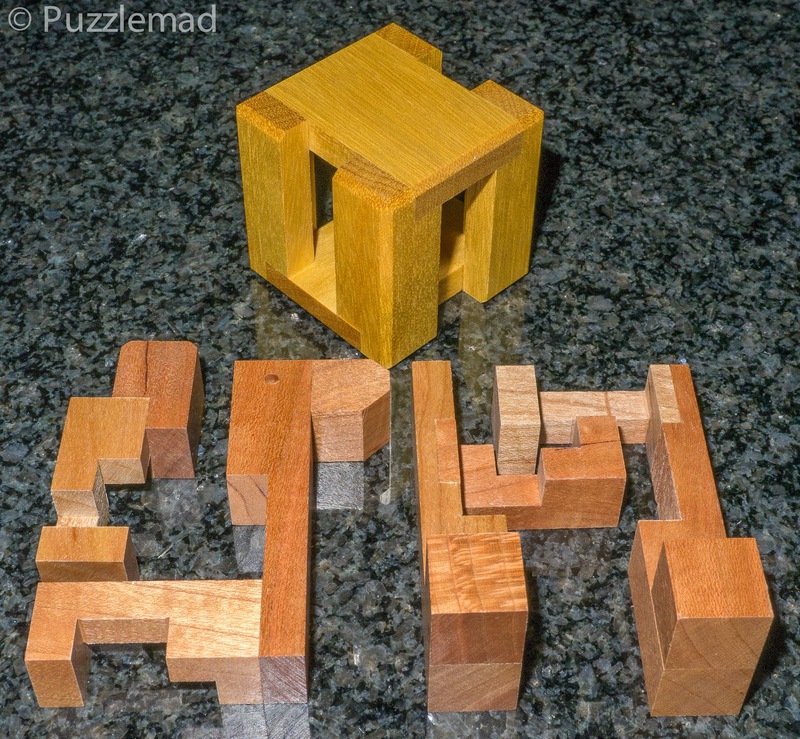 Basically, a lot of time and effort was spent making this puzzle not only strong, but aesthetically pleasing as well." I have to say that I agree with him - the attention to detail is phenomenal. Only 38 copies were made. It is a nice manipulatable size with dimensions 2“ x 2.5” x 4.25"
Now when I got mine out of the box the first move had been done by gravity or by the post office and this may be the reason why I missed out on one of the surprises. It would appear that in a fit of whimsy Eric had put either an egg or a chicken s**t inside which drops out during the solution! Now I had not known what to look for and suspect that it had either already fallen out into the packing peanuts and been thrown away (I could not find it despite rummaging around in them for a good while) or it had dropped out onto my lap and the chair when I opened it that evening. Either way my chicken poop was long gone. The photo to the left is from an FB conversation - it was taken by by Oli. Starting to play reveals that quite a lot of movement is possible from the beginning with this puzzle and it does get quite confusing pretty quickly. After just a few moves I seemed to be stuck - I thought I could see where the next move should be but it just wouldn’t go - I actually wondered whether Eric’s famed incredible tolerances had been a tiny bit too tight! But I really couldn’t believe that when everything else about the puzzle was so perfect he could possibly have got something so drastically wrong, so I sent out an email to the main MPP guys and got a little reassurance from Ali that I was not the only one who struggled at exactly that point and jumped to the wrong conclusion. With his reassurance, I continued to explore and after about an hour more I managed to find the VERY well disguised next move in the sequence. This opened up a whole lot more moves and suddenly a couple of pieces fell on the cat on my lap - he didn't seem to mind and carried on sleeping and dribbling on my knee! Very nice drumsticks on that chicken! I admired the beautiful precision of the pieces and also the complexity of them. It’s possible to hold 3 of the pieces together in place in the body/frame and this allows you to marvel at the complexity of the locking mechanism that has been designed with such a small number of pieces! That Olexandre chap is pretty impressive! I left them for a while to try and forget what I had done to dismantle it (not really necessary when they had sort of fallen into my lap in a heap without me really being aware of which pieces were first or second). When I came to try the reassembly I had been thinking to myself"
"it is only 4 pieces in a frame! How hard can it be?" You stupid boy!!! Yes, yet again, I reveal how I’m really not very bright! It’s true that there are only 4 pieces but I didn’t even remember which pieces needed to be inserted in which order. The only helpful feature was that having the final shape as a chicken meant that the final positions of the pieces were obvious! Well my aim to go to bed with a solved puzzle and nothing whirling round my mind at bedtime had failed - I could not for the life of me put it back together! A very disturbed night’s sleep occurred and I actually packed the pieces of my chicken into my work bag in the hope I’d get a chance there! Alas it wasn’t to be! I restarted my reassembly the following evening after dinner and proceeded to piss off Mrs S with my F’ing and blinding as I proceeded to totally fail to work it out. The following evening, I was chatting on FaceBook messenger with Derek (yes the genius!) about my miserable failure and he commiserated with me - he said he had not yet dismantled his copy. I said at that time that I was really hoping not to have to resort to my usual Burrtools method of reassembling the puzzle (although it is definitely a part of the fun for every burr puzzle to ultimately make a Burrtools file). With his encouragement, I persisted and tried a few more methods of reassembly when suddenly I had my Aha! moment and it suddenly slid back together! I have been thoroughly entertained by this one and can heartily recommend it - unfortunately they are all sold out just now but if they ever come up in an auction then you won’t be disappointed. All in all, a lovely puzzle with quirky looks, amazingly accurate production and a tremendous challenge to reassemble from scratch! Stick around for a while - it’s a public holiday this weekend! I might have another post for you tomorrow. Of course this will depend on “her” allowing me time to write and not do any more chores!! Here’s hoping!